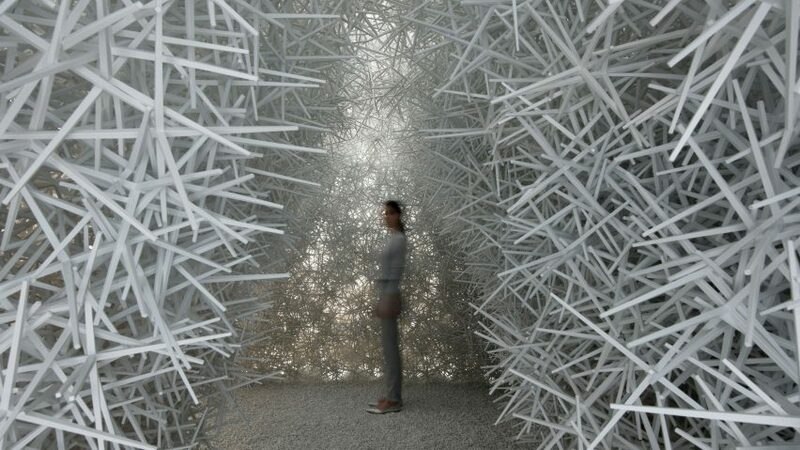 The University of Stuttgart's ICD Aggregate Pavilion 2018 is made from over 120,000 recycled plastic spiked stars that create a self-supporting structure bonded only by friction. Over a decade of research went into the project, applying lessons from large granular masses found in nature to architecture. Like grains of sand in a dune or snowflakes in a snowdrift, each individual element of the pavilion is held in place by contact force. Students and researchers at the University of Stuttgart built on the work of the 2015 pavilion, which used 30,000 particles, to create an even larger and more complex structure. The 2018 project is three metres tall and seven metres long, with two interconnecting vaults forming a fully enclosed space inside. The project aims to demonstrate the construction potential of large particles that can be distributed like a liquid, but form the self-supporting structures of a solid without the need for any binding material. Injection moulded recycled plastic was used to form the 120,000 hexapods and dekapods, which can be poured like concrete to rapidly interlock and form load-bearing shapes. To construct the pavilion 725 inflatable yellow spheres were used as formwork, onto which the spiked particles were poured. After the form was created the balloons were deflated and removed. With the white spines sticking out at angles, from a distance the pavilion appears to rest like a square but fluffy white cloud. The rectilinear form has a cave-like interior with a triangular archway that can accommodate several visitors. Constructing the pavilion from these granular materials had to be done in situ, with the industrial storage space used by the German university to hold the particles was converted into the production space. The boxes used to store the particles were emptied and stacked up to create the boundaries for the construction process. A custom-built, cable-driven parallel robot was fixed to the walls and beams of the space. The robot moved along the cables and deposited the particles to the exact point selected by the modelling system and deposited them. The robot is controlled by an interface that uses a parametric modelling environment, and the design and construction process used an image-segregation algorithm to check the structure's geometric accuracy. Because no external bonding materials or process is required, the pavilion can be dismantled and the pieces used to create entirely different configurations. Combining structures from nature with the latest technology is an important part of the research done at the University of Stuttgart. Last year they used drones and robots to weave a carbon fibre pavilion in a method similar to the way that moth larvae weave silk webs. In 2016 robots were deployed to stitch together a laminated plywood pavilion structured like a sea urchin.